Born in Namibia, Montgomery played 102 times for South Africa between 1997 and 2008 and is currently the most-capped and highest points scorer in Springboks history. He made his international bow against the British & Irish Lions in July 1997 as an outside centre and also featured at the 1999 Rugby World Cup. However his greatest achievement in Springbok colours came at the 2007 Rugby World Cup where he helped South Africa lift the game's biggest prize. He began his Currie Cup career with Western Province and made his Super Rugby debut for the Stormers before opting for a stint in Wales in 2002 with Newport and then the Newport Gwent Dragons. In 2003, Montgomery was sent off for pushing a touch judge to the ground, and was later heavily fined and given a two-year ban, with 18 months suspended. As a result he was ruled out of the 2003 Rugby World Cup in Australia. He returned home to South Africa in 2005 to play for Natal Sharks in the Currie Cup and the Sharks in Super Rugby but headed north again in 2007 to join French Top 14 side Perpignan. He rejoined Western Province and the Stormers in 2008 before bringing the curtain down on his playing career in May 2009 following the Super 14 season. 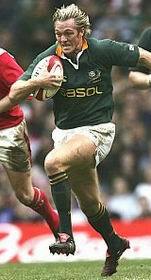 Montgomery had amassed 50 caps by the end of 2001 but his international career stalled when he moved to Wales as South Africa's selection policy demanded that only players who were playing in South Africa could be eligible for the Springboks. After a change in policy, he was recalled by new coach Jake White in 2004 and helped South Africa clinch the 2004 Tri-Nations crown. During the 2007 Rugby World Cup, Montgomery eclipsed Joost van der Westhuizen's record as the most-capped Springbok - making his 90th appearance for his country against Tonga. Montgomery announced his retirement from international rugby on August 30, 2008, after the Springboks beat Australia 53-8 in their last game of the 2008 Tri-Nations. But he re-joined the Springboks' set-up in May 2009 as the team's kicking consultant.